Species Being - "Orgone Therapy"
Track #'s 1 and 5 follow this formula with immense success. Track #2 follows from the first as if it might be an extension of that track's guitar theme, accompanied by watery synth effects, while track #3 is a more mid-paced jam-rock piece with jiggy organ. Track #4 is really the only point where the music gets particularly freaky or disturbing - perhaps comparable to a "Sonic Attack" sans vocals. In my top five albums of the year without a question. Playing on this album are: Eli Good - Guitar, Frank Grau - Drums, Jai Young Kim - Keyboards, Kenseth Thibideau - Bass. Al's Bar is a very pleasant and homey "hole-in-the wall" in the middle of the concrete wastelands of downtown L.A. Due to running a bit late, I thought we might miss all the opening bands but came just in time for a beer before local group Nels Cline appeared. Nels Cline are two L.A.-based guitarists (one apparently the band's namesake) who were accompanied by a local painter named Norton Wisdom. To be honest, I thought at first that perhaps Species Being (who were supposed to be on by this time) had already metamorphosed into a guitar duo with a painter for a light show, as the style was guitar heavy and improvised. Fortunately not. Not that I didn't enjoy Nels Cline and their paint-spattered buddy: they were quite impressive with their dark duel-guitar freak-out fed through numerous pedals and effects while Norton did a fine job of paint-provising along with them. His themes were mostly distorted figures of human beings in various states of human dissipation and degradation, though these were constantly segueing into new images, while here and there a word would pop up, 'S's turning into dollar signs, etc... then the guitarists would slow down, and Norton would obliterate his drawing into a rain of black drops before beginning a new theme as the music picked up again. At one point one of the guitarists brought out some bizarre little instrument, no bigger than a fist, and began blowing through it, which conjured some pretty freaky sounds to accompany the rest of the goings-on. I wouldn't mind catching them again, though perhaps my reaction is a little bolstered by the fact that I'd never seen a performance like this? To be honest, I'm just not sure. Nevertheless, it was a moment of personal anti-edification. I was quite shocked when, reading their tour schedule, I saw that Species Being was playing Redlands, Ca - my California home town of about 70,000 population. I soon found out that it would be taking place at the University of Redlands, which made some sense, since, though it's a tiny private school with little over 1000 students, it does have a reputable music department: they've had big names play there - though usually jazz! So how did Species Being land a gig there? Later I found out it was because bassist Ken attended UoR's "alternative make-your-own-major" school, the Johnston College. And it was in the basement of a Johnston dorm where Species Being got into some all-time musical grooves that ranked as one of the greatest live musical events of my entire life - I just can't help but be amazed by the irony of this happening in old "Deadlands". Anyway, when Species Being began their set, there were 5-6 people in the audience. By the set's end, a few more dormers had come down to see what the beautiful ruckus was about, totaling maybe 10 attendees in all. Didn't matter - Species Being did their thing. Perhaps partly because, since they're always improvising, they like to face each other in a sort of semi-circle, rather than the audience. Anyway, they did reach another plain. The acoustics of the little basement were also perfect and there was more clarity to their sound than at Al's. They played an hour-set of their fantastic take-you-up-take-you-down jamming psych which left me in pieces. Again, all members were totally "on" and totally "one", and much to my pleasure, the keyboardist's stuff had a much higher mix and clarity in this set, making for a freakier and edgier space-rock vibe than at Al's. He played, as at Al's, a Roland keyboard and another keyboard above from which he got most of the semi-pre-programmed synth sounds (forgive me for my technical ignorance when it comes to musical instruments). Again, my feet were tapping during the faster parts, but in a ridiculous be-boppish way - though their music is definitely not in that mold generally. Grau is just such an excellently busy drummer, that he conquers one's feet and makes them dance to his tune. They took a half-hour break and came back for yet another hour-or-so set, which was equally as good, though noticeably jazzier... until the "come-down" part where again Grau set his sticks down and his head back in exhaustion while the guitarist led the rest of the group out with an extremely slow fade that seemed like it might never end (I noticed my friend getting antsy here, but I was lovin' it), as he did everything to his guitar that he could to produce diverse and moody come-down sounds. Afterward I asked the guys if anyone got a recording and the answer was "nope". They were quite nonchalant about it, but I was a bit disappointed (I'll have to live with my memory, which isn't my greatest feature). Still, the guitarist too seemed especially moved by what the group had accomplished together that night. Again, he and the keyboardist did not play on the just-released "Orgone Therapy", but by the time they reached Redlands they were as in-sync as the players on the album; and I was told they are gonna do some stuff as a 6-piece in the near-future with the members from the album as well... catch 'em if you can! Orgone Therapy is distributed by InnerSPACE Records. You can visit their web site. 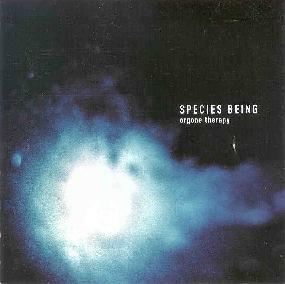 For more information about Species Being you can visit the Chaosophy Records web site.